I had heard the stories, of course. Scary accounts of trumped up traffic tickets, nights spent in Mexican jails, and requests for bribes. Fortunately, though, I had never had a run-in with a Mexican policeman. Over the past 25 years or so, I have driven south of the border dozens of times – sometimes with kids, dogs, and camping gear in tow. And although we often got the once-over at the border, I had never been stopped alongside the road. I wasn’t so lucky this time, however. As I drove into Sonoyta (Sonoita), the Mexican town just across the border from Lukeville, Arizona, on my way home from a short stay in the beach town of Puerto Peñasco (Rocky Point), Sonora, Mexico, I noticed a pick-up truck behind me, headlights flashing. I pulled over, and as the officer approached my car, he was shaking his head. He started out by saying the ticket would be 1,000 pesos. Not quite accustomed to the exchange rate, and because businesses take American money everywhere in Rocky Point, my sister and I asked how much that would be in dollars. He responded “$80.” We later realized that he had rounded up a bit. One thousand pesos actually amounts to about $62. When I said I didn’t have $80 on me, he immediately began bargaining. “How about $40?” he asked. By that time, I was rummaging in my purse, and I counted out my cash in front of him. “How much?” he asked. “Twenty-nine dollars,” I said. Without a blink, he responded, “That’s good,” grabbed my cash, and walked back to his truck. I guess I can consider myself lucky. It was a small amount of money, and it won’t (hopefully) show up on my Arizona driving record. And I, in all likelihood, was speeding. We had been chatting, and I admit I wasn’t paying close attention to the speed limit signs. When I told the story to a coworker, he pointed out that every time he had gotten in trouble in Mexico, it had started with him doing something stupid. By the way, though, when I did try to drive the speed limit for the rest of my trip through Sonoyta, I ended up with a huge train of Mexican cars behind me. It didn’t really feel realistic. The lesson, I guess: Watch your speeds closely when driving in Mexico. On our way into Mexico, my sister and I decided to stop for some quick refreshment in Sonoyta. She wanted tacos, and I wanted to buy a watermelon from a street vendor we had spotted. So I pulled over at a promising-looking taco stand (Compa Nacho), and walked up the street to make my watermelon purchase. When I came back, my sister was sitting at an outside table, drinking a bottle of Coke. Soon, a condiment tray appeared, containing a nice assortment of fresh pico de gallo, guacamole, red onions, and cucumbers. 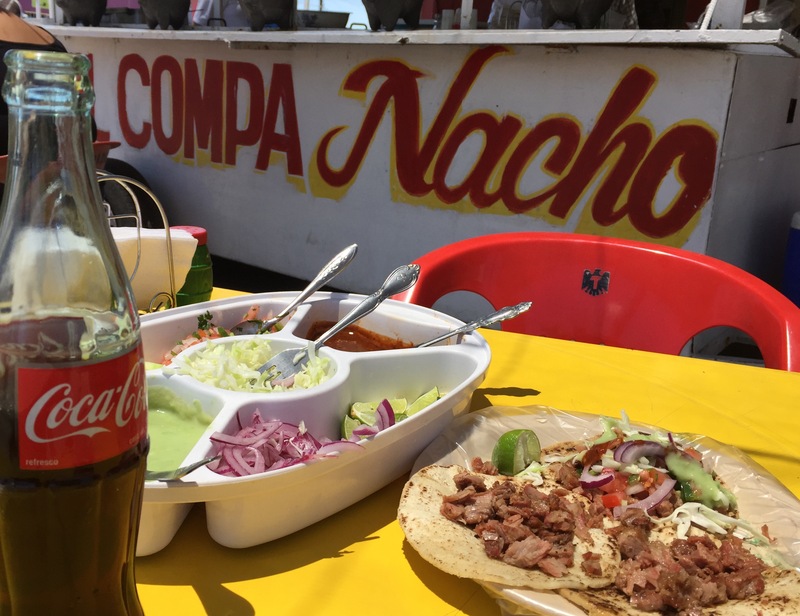 Then her lunch arrived – three soft corn tortillas piled with pork al pastor, and served with lime and shredded cabbage. Although I had decided to wait for the shrimp tacos in Rocky Point, she assured me that her roadside tacos were delicious. It didn’t seem to matter where we stopped, we were immediately approached by men – young and old – who wanted to wash our car windows. The first time it happens, it’s kind of charming, and you tip the guy and walk away assured they he will keep an eye on your car. After about the fourth or fifth time, though, it gets a little annoying. And the washers seem to get more aggressive. No matter how sternly you say ‘no,’ they go ahead, pull your windshield wipers up, and proceed to wash. Despite the dusty streets of Rocky Point, my car windows were never so clean! This actually began before we crossed the border, but I’m including it because it is all part of a road-trip-to-Rocky-Point experience. 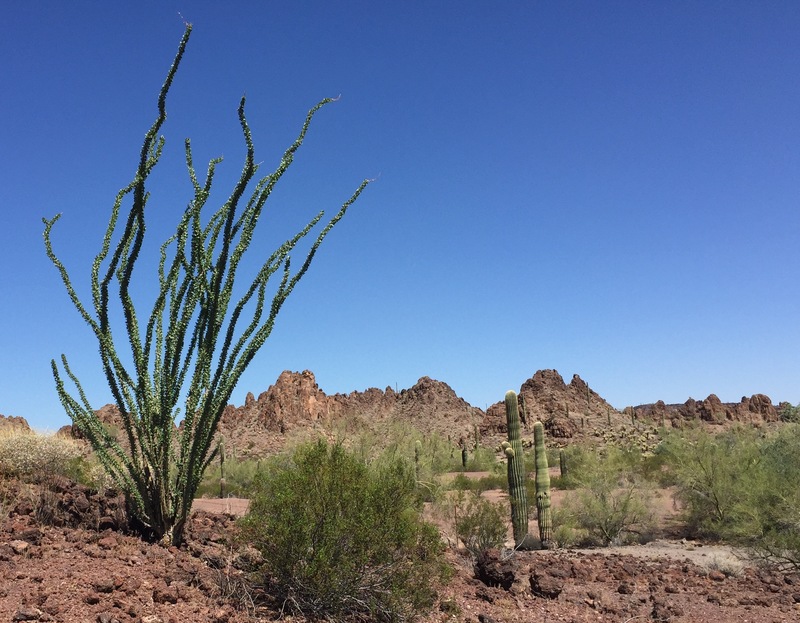 After you turn off of Interstate 10, and head south on Highway 85 through Gila Bend and Ajo, Arizona, you pass through some amazingly gorgeous desert terrain. Ocotillos and saguaros frame the rugged rocky views near the Goldwater Air Force Range, and the Organ Pipe Cactus National Monument. 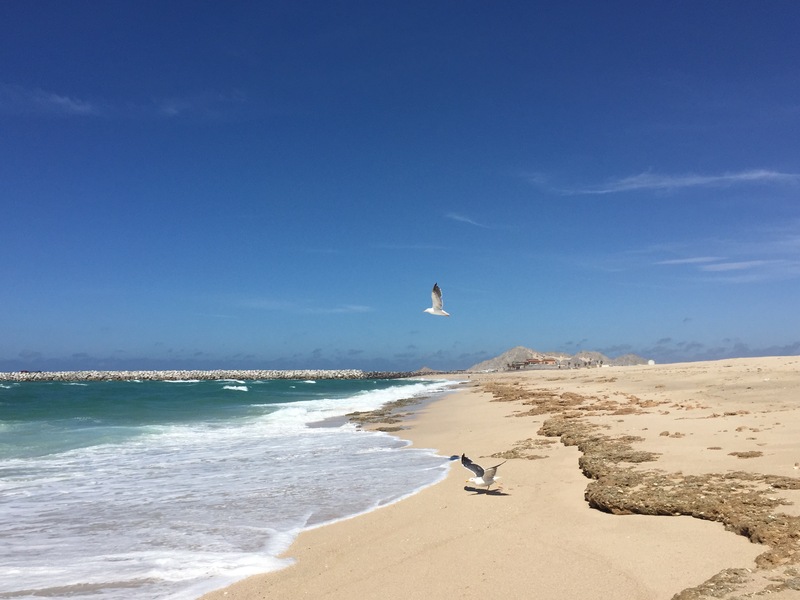 The views continue on the Mexico side, gradually transitioning to the sandy ocean-side terrain. Making a stop anywhere along this stretch yields some very cool photo opportunities. Mexican authorities don’t recognize your American car insurance, so buying extra car insurance is a necessity. I’ve never had to use it, but I have heard that you don’t want to have a car accident in Mexico without it. So, depending on the value of your car, expect to pay upwards of $20 a day to drive your car in Mexico. It’s quite the booming business in towns near the border, and you can stop for a quick quote almost anywhere in Ajo. And of course the biggest payoff of all: The beautiful beach! Hmmm… Having lived in Mexico, this sounds familiar… What a pain. Like you say, it wasn’t much money, but still – the whole thing is wrong! On the other hand – that beach looks amazing. Oh, and the roadside tacos, also! Cheers, g.
Thanks! Yes, I guess you take the bad with the good. 🙂 It IS a little frustrating, though – especially if you have to live with it all the time. BTW, your blog is great. It caught my attention because you had a post from the North Rim – one of my favorite places! I was driving through Rocky Point early in the morning (still dark) I was the only car as far as I could tell. Out of nowhere I had flashing lights behind me.. so I pulled over, Mind this was my first time in Mexico, traveling by myself just a road trip going back to Arizona. The young officer walked up to my car and told me that I drove through a stop sign …. stop signs are plenty in Puerto Penasco in various stages of fading and what seems totally randomly placed. long story short, the officer asked for $105 and if I wanted a receipt I would have to go to the police station which was closed and would not be open until 7 am. I didn’t have enough cash and the officer was nice enough to guide me to ATMs , I paid him and since I didn’t want to hang around for 2 hours headed north .. moral of the story….. I guess there is none, it’s Mexico !!! Wow, that sounds scary! Pretty similar to my experience in Sonoyta, although I guess I was lucky he didn’t guide me to an ATM. You’re right – there’s really no moral of the story. It’s just frustrating. I hope it was a fun trip otherwise. I do love Rocky Point! Thanks for reading.